The Ankle Lace System (ALS) allows the lace to pull around the back of the ankle to provide an improved fit and eliminating foot movement inside the shoe. The Ankle Lace System (ALS) developed by Boreal is an advanced lacing method designed to securely hold the foot in place. 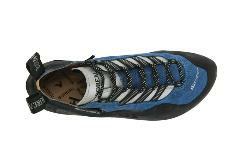 The lace runs through an extended webbing loop that runs around the back of the ankle. This allows the shoe to be more closely pulled around the foot, locking the heel in place and eliminating movement within the shoe. With the Spider, we have demonstrated our ability to think differently. Using their innovative one-piece IRS™ (Integrated Rand System) has resulted in a shoe with outstanding fit, precision and durability. The innovative IRS™ (Integrated Rand System) injection moulded technology is a one-piece sole, rand and heel unit which delivers an unrivalled combination of fit, support, sensitivity and durability. A premium quality split leather and lorica upper with canvas lining is combined with our unique Ankle Lacing System™ to fully enclose and hold the foot. With a medium stiffness midsole and sticky FS Quattro™ rubber you can edge and smear with confidence, no matter what the rock type. 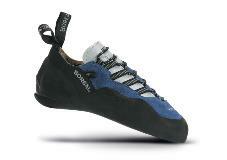 Suited to sport climbing, long routes and training, Spider is an incredibly comfortable and durable style. Boreal Q-X utilizes the innovative IRS™ (Integrated Rand System) to produce a superb combination of comfort and durability. The sticky and long-lasting FS-Quattro™ rubber provides outstanding friction, meaning you can concentrate on enjoying the climb.